Fr. 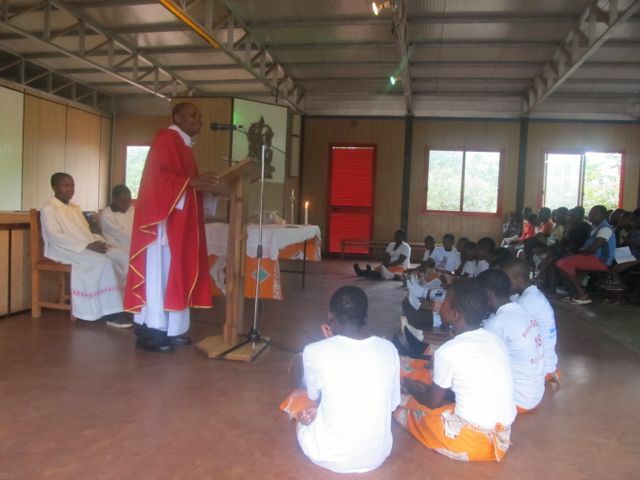 Ronald Kalindawalo, the Mangochi Diocese Youth Chaplain celebrated mass with students of Andiamo Education Institutions (AEI) on Thursday, 6 February 2014. After the mass, Fr. Kalindawalo had an audience with all the Young Christian Students (YCS). He encouraged them to work hard in school for them to achieve what they are aspiring to be in the future. “Every profession needs school,” he also stressed that the youth are the future church and the Church is relying on them. They must start now to be active members of the church. Fr. Kalindawalo encouraged them to read different books and Catechism about the youth in the church. Fr. Kalindawalo has since thanked Alessandro Marchetti, the Director of Schools, for welcoming him on behalf of Fr. Mario Pacific and Don Cesare both the founding trustees of Andiamo Youth Cooperative Trust. This entry was posted in Education, News from Malawi and tagged AEI. Andiamo Education Institutions, Andiamo Youth Cooperative Trust, Don Cesare, Fr.Mario Pacifici. Bookmark the permalink.